In Marla Klein and Ivy Wilde’s world, teens are the gatekeepers of culture. A top fashion label employs sixteen-year-old Marla to dictate hot new clothing trends, while Ivy, a teen pop star, popularizes the garments that Marla approves. Both girls are pawns in a calculated but seductive system of corporate control, and both begin to question their world’s aggressive levels of consumption. Will their new “eco-chic” trend subversively resist and overturn the industry that controls every part of their lives? Smart, provocative, and entertaining, this thrilling page-turner for teens questions the cult like mentality of fame and fashion. Are you in or are you out? In a time where it seems like most of the dystopias published are trilogies, it's strangely refreshing to have one self-contained book. Don't get me wrong, I like a good trilogy, but it's been so very long since I've finished a trilogy because I was invested in the story and not simply because I felt like I had to power through to the end. Admittedly, I'd probably enjoy most of my reading experiences more if I could get out of that stubborn mindset. Material Girls was something that drew me in and refused to let go. For the first time in a very long time, I found myself nearing the end of the book and aching for another one. It seemed impossible to me that the story could resolve itself with only a couple chapters left and I was actively angry at the idea that I might have to wait for another installment. I can't remember the last time a book made me feel like that. Heck, I can't remember the last time anything media made me feel like that. Fortunately, the author worked her magic and everything was satisfyingly resolved, and this book that I truly couldn't put down left me feeling like I'd just spent a sunny day lying in a hammock with an old literary friend. So, with all that said, let's actually talk about this book, shall we? The blurb describes it as Project Runway meets Divergent. While I can see why both those names were used, I don't think that's entirely accurate. Is it a dystopia? Yes, absolutely. Is it your typical kind of dystopia? No, definitely not. Children are sorted and then segregated from each other, yes, but the point of the book isn't to bring down the whole system like nearly every other dystopia on the market seems to encourage. There is a revolution, yes, but there's no Top Secret Underground Rebellion lurking in the Appropriately Named Wilderness in this book. 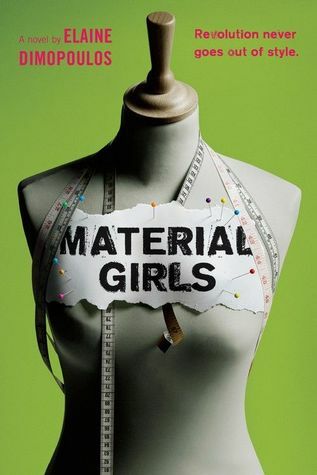 Material Girls is a cutting critique of capitalism, treatment of workers, and true freedom to be oneself. It's a book that artfully deals with a number of complex issues. Nobody is forced into rebellion. So many of the things that happen are the result of people choosing for themselves. The only real bullying and oppression comes from above, not within. Now, here's the part where I admit my bias. I come from a long line of people involved in Unions. I'm not ashamed of that. I believe in the necessity of unions to protect workers' rights and contribute to better quality of life for everyone involved in the process. Without unions, after all, we'd still have child labor. Heck, the creative industries in the book are built on child labor. There comes a point in the book where one of the MCs, Marla, gets involved with the initial organizing of a union. Having admitted my bias here, I'm also going to freely admit that I've been involved in an organizing effort. The way things went down in the book were in some ways exaggerated for fiction, but most of that had to do with needing to move the plot forward and not the actual effort itself. Now, my involvement in the real world ended when I could no longer live with the conditions we were working under and made the choice to leave the company. The book? Generally accurate. Elaine Dimopoulos has clearly done her research and applied it in such a way that it still felt like a story and not just a retelling of typical practices and results when organizing. It's done so well that I want to hand this book to other authors and say, "Here, this is how you use all that research you've done." Maybe the author herself has been involved in an organizing effort and this is a well executed version of that common Write What You Know lesson. Maybe she hasn't. I don't know. Frankly, it's none of my business. What I do know is that I absolutely adored this book. It wasn't what I expected it to be. It's a story about growing up, about growing apart, about finding yourself and your passion no matter how long that takes. Regardless of your personal political opinion of unions, don't let that plot device stop you from reading it. It's not propaganda. It's a story about people, the accepted value of creativity, and it is absolutely 100% worth your time. The only regret I have is that I read this as an ARC and have to wait until release day to buy copies and hand them to people. Don't get me wrong, though, I absolutely will be purchasing this book when it comes out, and I am so, so thrilled to be able to say that about something. So, if you don't mind me I'm going to go see if Elaine Dimopoulos has anything else published so that I can devour that in the meantime.